It's been a long time since our last blog post...My sincere apologies for lack of posts - We have been busy busy busy wrapping up a few installations and continuing with a few new designs since the holidays. Below are two renderings of kitchen designs we are currently working on. We can't wait to get started on the actual installations! Modern in the mountains. Matte white and rich wood veneer come together to form a space that will be clean and inviting after a long day on the slopes in Winter Park. Our take on a clean traditional kitchen. The hood will be custom made by Raw Urth Designs in Fort Collins and the butcher block on the island will be fabricated right here in Denver by Heartwood Carpentry. A couple quick snapshots of a nearly complete bath remodel in Boulder. 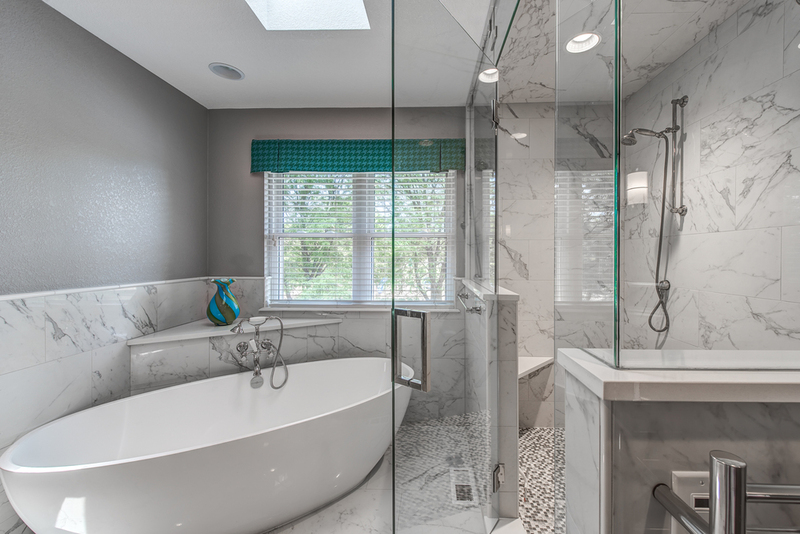 What we love about this bathroom: Mixture of interesting materials - limestone, porcelain, marble, quartz...the lighting...free standing tub and floor mount tub filler, and mostly that shower! We are incredibly excited for a new project that will be delivering next month! This rendering is a view of the kitchen and butler's pantry. Working with a very neutral palette of warm grays and whites, this whole house is going to be transformed. Very thankful to Ruggles Mabe Studio for referring us on this wonderful project. We are seeing a lot of traction in the "rustic modern" design trend. What exactly is rustic modern and how can you achieve it in your space? In it's most basic idea, Rustic Modern is the use of rustic or old materials in a decidedly modern form. When it comes to kitchens, this idea can be achieved by creating long lineal lines with flat cut slab veneer cabinet doors (as pictured above). Hardware should be minimal, non-existent if possible and wherever possible choose a muted color. Choosing materials is perhaps the most important aspect of the rustic modern kitchen. It's important to mix in different textures to form a basis for a space that FEELS different. In the photograph above, the slab doors are contrasted by heavy flat black pilasters to anchor the island and perimeter cabinetry. Pictured above, light natural pine flooring forms the basis for a very Scandinavian feeling space. The island, elevated off the floor, has clean lines, no cabinet hardware, and mixes in a stainless steel appliance. The overall effect is clean, minimalistic, but also inviting. Here is a beautiful example of rustic modern. Reclaimed flooring mixed with high gloss white cabinetry and an abundance of natural light. The countertops are gray quartz. In this example, the brushed nickel hardware is not my favorite, but it works. Take a look at the photos in this post and you'll see a basic common thread throughout all of them. No wall cabinets! Each of these kitchens lacks them completely. We're seeing this trend in a lot of our new designs. Floating and open shelves are a great statement piece in your kitchen if you can commit to keeping your space fairly organized. If you are thinking of updating your kitchen or are designing a new home and are in need of inspiration for your new kitchen, please reach out to us for a consultation. If you've taken the initiative to hire a designer for your upcoming new build or remodeling project, then it makes sense to get the most out of your time spent with them. As you will most likely be paying hourly design fees upwards of $100/hr for these services, doesn't it make sense to get the most out of each design consult as possible?? I've designed hundreds of kitchens and bathrooms, and probably conducted over a thousand design consultations over the past decade. Throughout the years, a common theme has emerged among our most successful projects. The homeowners that come prepared to our meetings generally speaking have the most fun and the most striking results. 1. Create a Houzz.com Ideabook full of photos of projects that you love. Write comments on each photo about what you like in each photo. Most importantly share it with your designer so they can make the most out of the research you've done up front. Alternatively, you can also use Pinterest. 2. Establish a realistic budget. Set your numbers in the very beginning. The more precise you can be with your actual budget, the more likely you are to come in on budget. 3. Create a list of "must haves" and a list of "definitely nots". Hand these off at the initial design consult. Ideally, this list will also outline the overall scope of work that you're looking to have done. 4. Talk to your friends who have recently built or remodeled a project in their home. You'll get a first hand account of what the design and construction process is truly like. Gaining this knowledge is going to guide your expectations and keep your dreams in line with reality. 5. Approach the consultation with an open mind. Be willing to think outside the box in terms of layout, process, or aesthetic. You've had months (sometimes years) to ponder what your new space might be like. A designer who sees your home for the first time might have a completely different take on what is best for the space. A few months ago, we were contacted for content regarding how to discuss budget with customers by Houzz.com. We were happy to oblige, and the article went live today! A quick shot of the range / hood / fridge wall from a project that is nearing completion in Aspen. The cabinetry is Textured European Oak Veneer with a special "liming" process from Greenfield Cabinetry. Wolf range with integrated pro hood above. Door to right is a 36" fully integrated Sub Zero unit and the door on the left leads into the pantry. The stone behind the range is a translucent natural material that is backlit. Big thank you to Ruggles Mabe Studio for bringing us in on such a fantastic fun project. 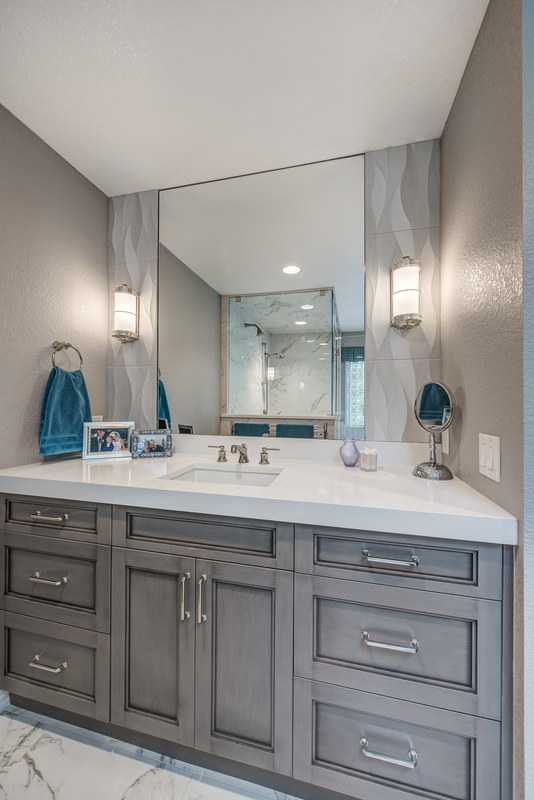 After a few concepts exploring different configurations, our homeowners decided that a free standing tub, his and hers vanities, and a spectacular shower were tops on their list. Photos from the completed renovation. We relocated the shower, tub, and the entrance into the bathroom. This post encompasses weeks 7-9 of the remodel process for this particular project. To recap: we decided to completely relocate the kitchen from one part of the house to another. We moved it from a smaller space that was directly located next to the garage down to a much larger space - which was previously a living room. In addition to this - we've refinished all the flooring, redone the fireplace, and are also updating a small powder room. Last week was really exciting! Our countertops and appliances were installed in the same day. It was quite a transformation and we certainly have to tip our cap to the general contractor who orchestrated all the trades working in one space together. Our final post following this project will most likely not happen for a few weeks. Our general contractor is taking a much needed vacation and will be back in two weeks after a trip to Australia to finish up the last few details of this project. A close up shot of a "live edge" piece of walnut that will be installed as the powder room vanity top. It's been a while since our last update on our kitchen remodel in Boulder. This post will summarize the past few weeks worth of progress. The new entryway between dining room and kitchen was created. These are the new stairs between the two spaces. Although it is tough to tell, there was a lot of progress last week. The plumbers were able to successfully create new plumbing connections for the main sink, cooktop, and bar sink. This week, the electricians are in the space, roughing in all the connections necessary for the new appliances and GFCI receptacles required in the kitchen. The flooring contractor dropped off some stain samples for our floors, which are going to be refinished starting next week. Here's a look at our cabinetry finishes along with the flooring samples. We are leaning towards the natural oak which will receive one treatment of bleach to lighten it and remove any orange / red tones. We are also specifying a water based finish to prevent any "honey" coloring over the years. Here is the favored wood stain next to the new mudroom entry tile. Interested in following one of our kitchen remodels from start to finish? Good! You're in luck. We're going to be posting entries here as often as possible - shooting for weekly updates - following one of our kitchen remodels in Boulder. Today is the first entry - and I'm going to use a few photos and drawings to illustrate the old house footprint and what we aim to accomplish with the kitchen remodel. Here is a drawing of the existing house - pre - remodel. As you can see, the kitchen currently occupies the smallest room on the main level of the house. And while the kitchen is the smallest room on the main level, the room with the most space, the lower living room, sits mostly under-utilized. And here is a 3-D rendering of what the new kitchen space will look like once completed. 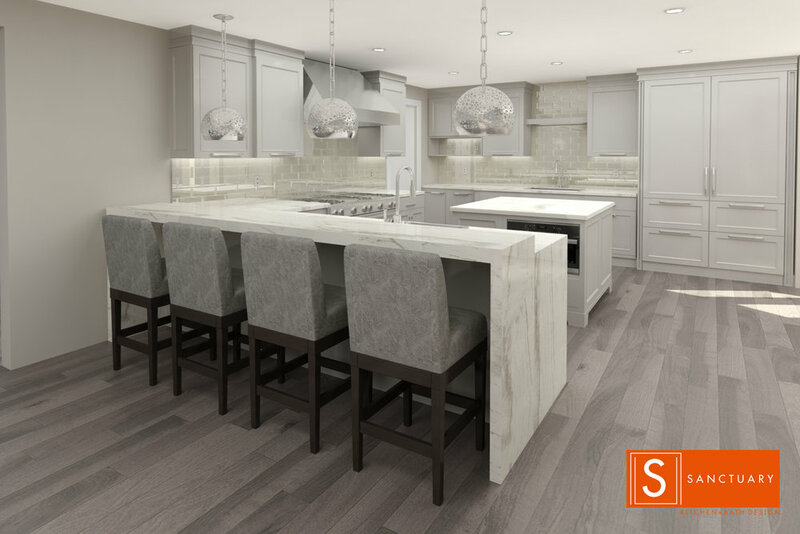 A mix of zebra wood veneer and high gloss white cabinetry will be topped with a white quartz countertop and a really amazing walnut top on the island. Sub Zero and Wolf appliances are complimented by the back painted white back splash. We're even incorporating a new bar into the space to create a place where our homeowners can make a drink after a day at the office. First phase of demolition was completed yesterday. Here's our first pic of the new kitchen space, after the built ins were removed. Check back with our blog regularly to see the progress as we completely transform this home. We are aiming for weekly updates with photos and notes of our progress. This transitional kitchen will soon belong to a family of four in North Boulder. With construction slated to begin in May, we are just a few months away from completely transforming their space into something really magnificent! Sanctuary Kitchen Design Awarded "Best of Houzz 2016"
Sanctuary Kitchen Design is proud to have been awarded "Best of Houzz 2016" in the customer service category. We are very excited to be entering the final design phase of a fantastic project in Boulder. This project will be quite extensive in scope, as we are moving the kitchen to a completely separate room in the home. This transformation is going to give the homeowners a phenomal dining room in the space previously occupied by the old kitchen, and allow for a much larger new kitchen in a previously under utilized space. Below is a rendering of the new kitchen. We've just completed renderings for a fantastic kitchen in Cherry Hills Village. This kitchen will be comprised of high gloss walnut, antique mirror, and brush stroke paint on the main island. We are implementing a system of hidden niche storage for the back wall of the kitchen. Once installed, these sliding doors will hide some really great functional storage for spices, oils, and other cooking items. This custom shelving unit was created using plumber's pipe and reclaimed boards that were found in a neighbor's back yard. We think the overall effect is really unique now that it is installed on this tiled wall. You can achieve some pretty unique looks by mixing materials that wouldn't naturally be found together. Here, we used steel, reclaimed wood, and a marble-looking tile to create an aesthetic that is eclectic and interesting.